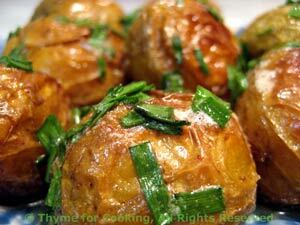 Oven Roasted Potatoes with Chive Butter, gourmet side dish. Toss with oil, lightly salt and put into a baking dish large enough for them to be in a single layer. Bake at 400F for 30 minutes. Note: The Nutrition Information assumes that half of the oil is consumed; the other remains in the bowl/pan.